It’s time to choose a theme for your WordPress.com blog. In this case, the word theme is synonymous with the words design and template. All three words describe the very same things: the visual layout and appearance of your blog. On the Dashboard, click the Themes link on the Appearance menu. A page full of themes appears along with a thumbnail image of each theme so you get a basic idea of what it looks like. Scroll through the themes and when you find one you like, hover your mouse pointer over the thumbnail image associated with it or click the Activate and Preview links for more options (on Premium themes, the buttons are Purchase and Preview). What happens next is pretty nifty! A new page pops up showing you a preview of what your own blog would look like with that particular theme and any options you set. You can also just click the Activate link to use the theme immediately with its default options, or click the Details link to see more information about the theme. You can page through the list of available themes by using the handy menu links under Themes at the top of the page. You can browse by the following: Trending, Popular, Newest, and Premium on the left side, and All, Free, and Premium on the right side. You can also search for themes by typing a keyword in the search box at the top of the Themes page. Click the Activate link in the lower right corner of the theme you’re previewing to activate the theme on your own blog, or click the Cancel link in the top-left corner if you decide that you’d rather not use that theme. No, really — it’s just that easy. If you get tired of your theme, go to the Themes link and click a different theme name, and you’re done. 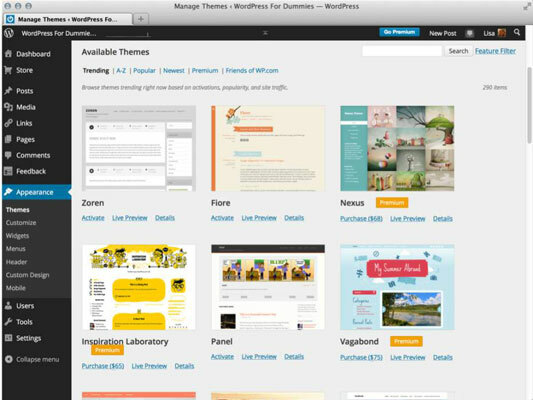 Some of the themes you find on the Themes page on your Dashboard may be marked Premium, and WordPress.com requires payment from you before you can use them.